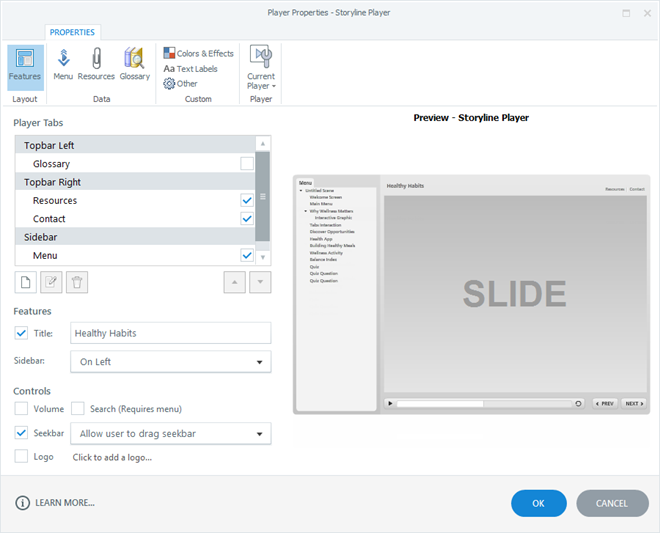 Articulate Storyline lets you choose which features and controls are included on your course player. To customize your player, go to the Home tab on the ribbon and click Player. 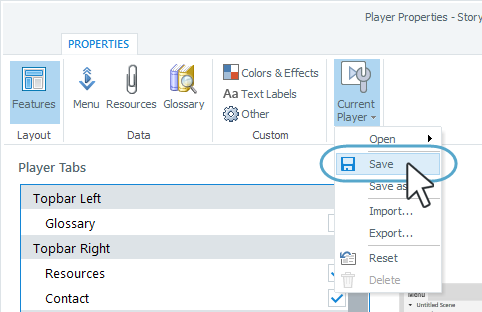 When the Player Properties window appears, the Features button will already be selected on the ribbon, so you can begin choosing your preferences. As you make changes on the left side of the window, the Preview area on the right will update to reflect your choices. Use player tabs to display additional content in your course. Player tabs can be added to the sidebar or the topbar of your course player. Just mark the box for each tab you'd like to include. Multiple tabs can be located in each area of the player. To move a tab from one location to another, select the tab name, then use the Up and Down arrows to move it to a different location on the player. If you'd prefer not to have a sidebar in your course, uncheck all the player tabs or move them to the topbar, and turn off the logo. The built-in player tabs can be moved to the sidebar. Custom player tabs (see below) can only be added to the Topbar Left and Topbar Right. Click Add (the icon that looks like a blank piece of paper) below the list of player tabs. Name: Enter a name for the tab as you want it to appear in your published course. Align: Use this drop-down to choose where to display the tab. Choose Topbar Left or Topbar Right. 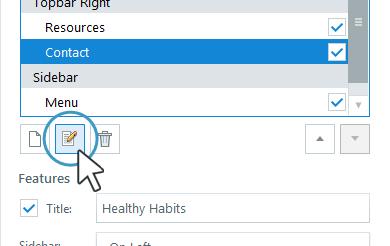 Action: Use this drop-down (and the contextual fields that follow) to define what should happen when learners click your custom tab. For example, if you want to display content in a lightbox, select Lightbox slide, then choose the slide you want to lightbox. To learn more about triggers, see this tutorial. When you're finished, click OK.
To edit a custom player tab, just select it and click Edit (the pencil icon). 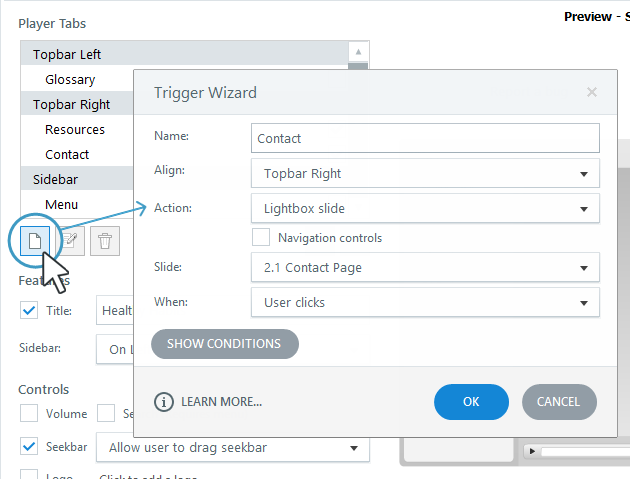 When the Trigger Wizard appears, you can change the tab's name, location, and action. See the section above for trigger details. Tip: The built-in player tabs can't be edited, but you can change their names. See Customizing the Text Labels. To remove (or hide) a player tab, uncheck its box. 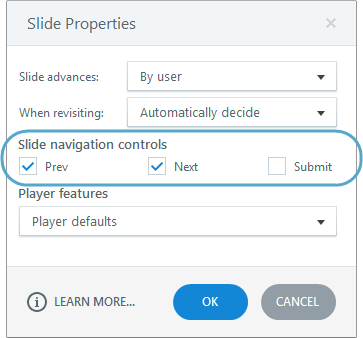 By default, player tabs that you've enabled will display for all slides in your course, but you can hide them on a slide-by-slide basis. To learn how, see this tutorial. In the Features area of the window, you can add a course title and choose where to display the sidebar. Title: Mark this box if you want the course title to appear in the top left corner of your player. The title defaults to the name of your Storyline project file, but you can change it. Just edit the text in the field provided. (Changing the title won't change the name of your project file; it'll only change the title that displays on the player.) If you'd prefer not to display a title, uncheck the Title box. Sidebar: A sidebar will appear in your published course if you've chosen to include any player tabs in the sidebar or if you've added a logo. By default, the sidebar appears on the left side of your player, but you can move it to the right side if you'd prefer. Choose a location from the Sidebar drop-down. In the lower left corner of the window, mark the boxes for the controls you'd like to add to your player. Volume: This displays a volume controller in the lower left corner of your player. Search: This adds a search field to the bottom of the Menu tab. Learners can use it to search for text in your course. Since the Search field is part of the Menu tab, it'll only appear in your published course if you've enabled the Menu tab. Seekbar: This adds a seekbar to the bottom of your player. It's a good visual indicator of the slide's timeline. If you add a seekbar to your player, use the accompanying drop-down to choose whether learners can use it to scrub back and forth along the timeline or make it read-only. To add a logo to the top of the sidebar, mark the Logo box, then use the Click to add a logo link to browse to the image. For the best results, use an image that has a maximum width of 200 pixels and a maximum height of 220 pixels. If your image doesn't fit within these dimensions, Storyline will scale it to fit. If you add a logo to your player but later decide you want to use a different image, click the delete link and browse to another image. If you change your mind about having a logo, just uncheck the Logo box to disable it. Navigation buttons (Prev, Next, Submit) are customized on a slide-by-slide basis. See Adjusting Slide Properties for details. When you click OK to close the Player Properties window, Storyline saves your player customizations in your project file. However, if you'd like to use the same customizations in other projects, click Current Player on the ribbon and choose Save. Enter a name for the player if you're prompted and click OK.
To learn more about the Current Player options, see Saving Your Player or Switching to a Different One.